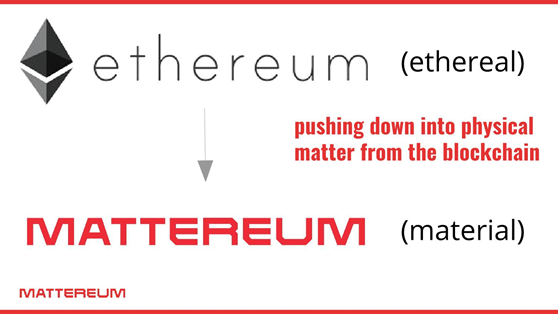 In March 2019, Mattereum’s CEO Vinay Gupta spoke at the Ethereum Community Conference in Paris. Here is the transcript of his talk. The video of the talk can be found here. I am Vinay Gupta, I was the original launch coordinator for Ethereum, so I kind of project managed the launch of Frontier and a bunch of the other names of things I invented, and I’m going to talk about what I’ve been doing since then, very briefly. That was four years ago, we’ve really come a long way, but there are certain barriers that we haven’t been able to break through. Conceptually we’ve developed enormous amounts of stuff for dealing with nonphysical things, but we still haven’t succeeded in getting a breakthrough into the real world. So this talk is going to be about how we use Ethereum smart contracts to control real-world assets, and this includes things like security tokens, but it also includes things like renting hotel rooms, electronic locks and all the rest of that kind of stuff that we’ve talked about doing, but we haven’t yet done in any kind of scaled way. 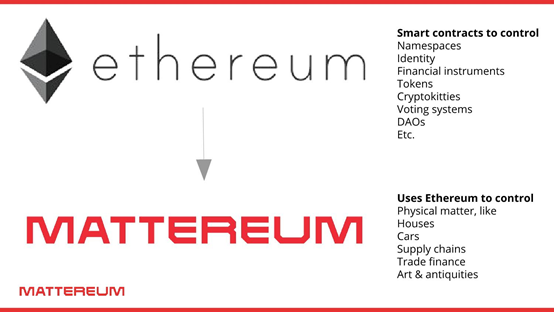 We start with the concept of Ethereum. It’s a thing which handles the ethereal world, it’s good for handling nonphysical stuff; that’s what it’s for, that’s what it’s about, and it works very well for doing that. Mattereum, on the other hand, is for handling physical stuff. It’s a way of using Ethereum smart contracts to control physical things, and by “control physical things” what I mean is control the legal aspect of a physical thing: the proprietary rights, the contractual rights. 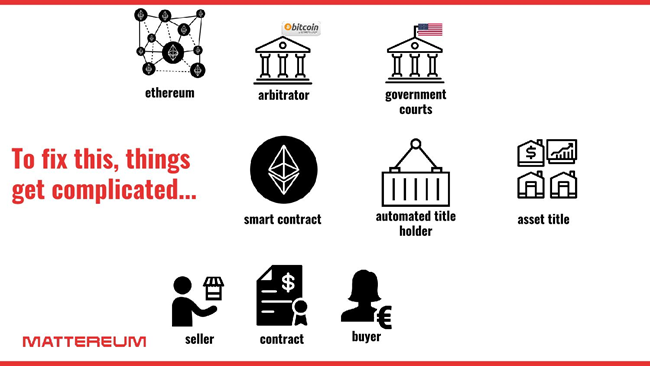 We’re not talking about things like robots here; we’re talking about the practical legal business of doing things like buying and selling houses, cars and this kind of stuff, and it all uses Ethereum smart contracts as a way of writing to the legal system. You could think of this as almost being like the inverse of an oracle. An oracle reads data from the real world and puts it into a smart contract; this takes data from a smart contract and writes it into the real world, in a way which is recognisable by legal courts as an event, a thing happens. This gives you some sense of the sorts of applications we’re talking about. 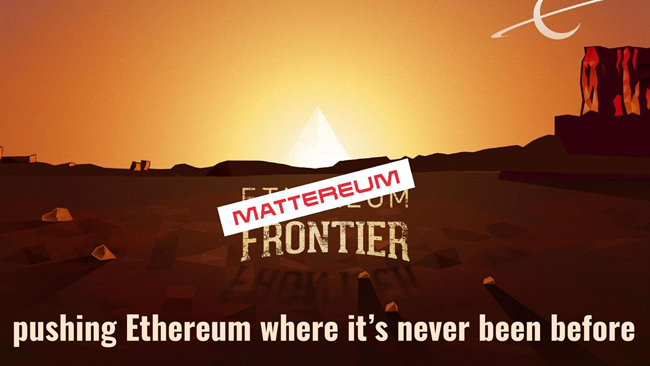 Ethereum does things like ICOs, Mattereum does things like being able to buy and sell physical stuff. It’s all the same technology, but it’s embedded in a legal context which allows those technologies to write to the legal system, and exactly how that works is what I’m mainly going to be talking about. 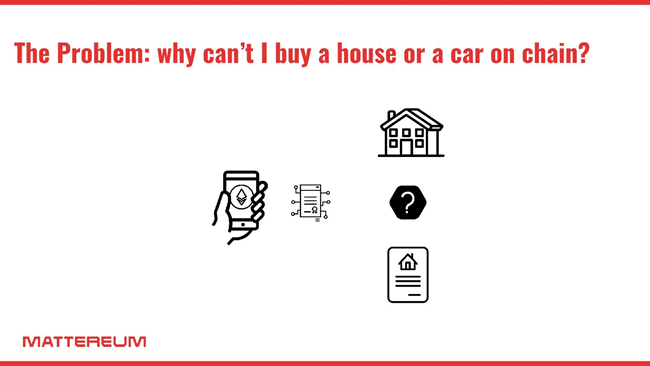 Let’s start with this basic question: why can’t I buy a house using a smart contract? There are some practical questions, like what about the volatility of the coin you’re using? We’re beginning to resolve that with things like Dai. 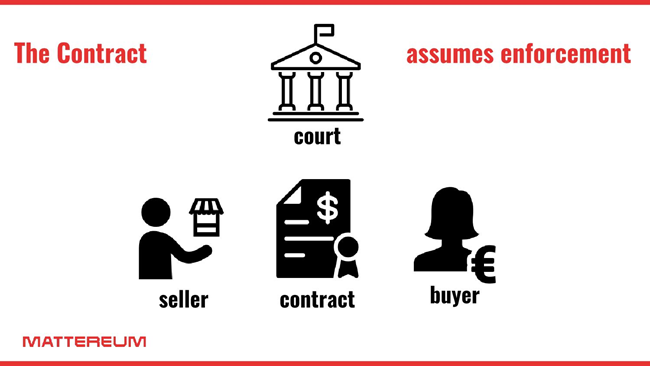 But there’s a deeper problem, which is you buy and sell houses on contracts, and that contractual framework includes within it implicitly a court. Because a contract is only a contract if somebody will enforce the contract. 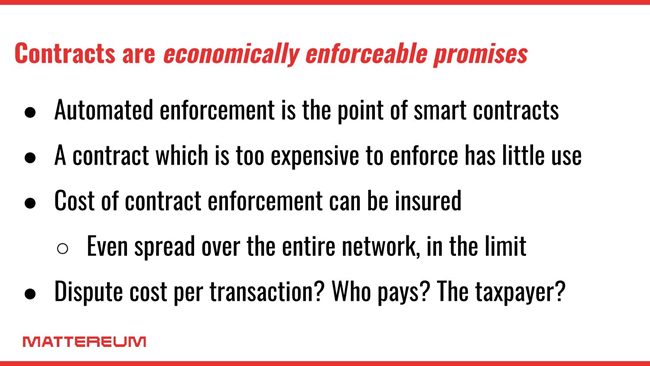 If there’s no possibility of contract enforcement, you don’t really have a contract; you just have a piece of paper with some notes about what was going to happen on it. Contracts are enforceable, or they’re not useful. So in each contract there is an implicit court, and the implicit court, if you don’t specify it, will be the court of the country that the people who are executing the contract are in — so if we do a contract here today, it will be heard in a French court if something goes wrong — but contracts allow you to specify what legal system and what court you’re going to have used in the contract. So you can specify which court system will hear the contract, but you can also specify your choice of law. So you could do weird and esoteric things, like saying that you want to use Japanese law for a contract that’s signed by two French citizens, and the world’s legal systems allow for that, because it just turns out that things like that are necessary sometimes and so their courts allow it. This allows for institutions called arbitration courts or private courts, and these things show up all over the blockchain space. There’s lots and lots and lots of discussion about using arbitration, there must be 15 or 20 blockchain startups which are discussing providing arbitration services. Because what this allows you to generate is a court which actually understands what it is that you’re doing. And this construct, the private court system that understands what you’re doing, is necessary to provide legal enforceability to a smart contract, if the smart contract isn’t fully in control of all the assets on-chain. So if you’re doing things like an atomic swap, all of the assets are on-chain, Ether goes in and an ERC20 token comes out, but there’s no point at which there’s a possibility for the contract to diverge from reality, because everything is on-chain, it’s a sealed system. When you want to come out into the real world, you could get contract disputes — you paid me Ether, I didn’t give you my house — and in those situations you need an arbitration court to come in and sort the mess out. Once you think about this in the context of economic enforcement, you begin to see where the questions are in these systems. 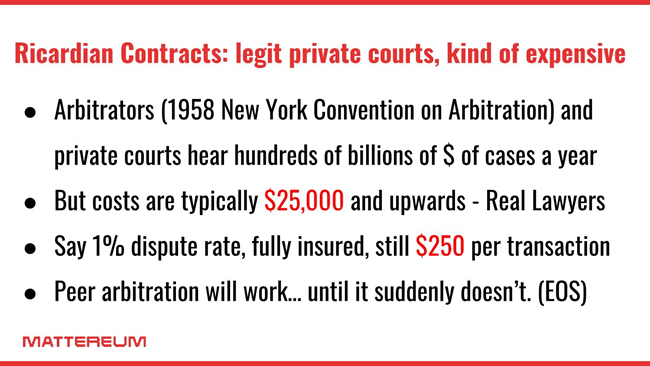 Arbitration courts are not free; you have to pay these people, because it is, after all, a private court, and they are damn expensive. So you go from the kind of fiat court, where your taxes are what are paying for these legal services, forward through to the arbitration court, which is a private transaction. And these things are damn expensive, because the arbitrators are very high-level lawyers in most cases, and they’re charging you $400/hour for a few days of work to resolve the dispute. By the time you’ve had a proper arbitration that would have gone through for some mildly complex case, $25,000 of costs would not be at all surprising. If you imagine $25,000 of costs with say a 1% dispute rate, even if you insure the risk so it’s spread out over everybody that’s involved in the transactions, every user has to put money into the arbitration pot so that you’ve got good access to justice when something goes wrong, it’s still going to cost you something like $250 a transaction, and that’s unsustainable for ordinary trade. It might work if you’re doing some multimillion-dollar bond deals, but it’s not going to be the kind of thing that will allow you to sell houses and cars and couches and so on — there is just too much friction. And even if you engineer that friction down, you’re not going to get it below the threshold where you could compete with something like eBay — it’s just too damn expensive. Peer arbitration has been discussed a lot, there are a lot of people that talk about doing peer arbitration. The problem with peer arbitration is the 1958 New York Convention on Foreign Arbitral Awards, which allows for international enforceability of arbitration says if you’re going to have an enforceable award, it’s based on a thing called the principle of comity: if the judges in one jurisdiction say, “Well, these guys in the other jurisdiction are also judges, they’re a lot like us,” there’s a brotherhood between all the people that are implementing law, and as a result we will abide their guidance on what should happen locally, and we will weigh their awards as if they were our awards.” That system breaks down when you have judges in one jurisdiction having a deal with the awards that were made by nonprofessional legal people in another jurisdiction. So if somebody comes in with an arbitration award from another peer arbitrator, and says, “Right, I want you to sell this guy’s house and give me the proceeds,” it’s very plausible that somebody will simply say no, and at that point the peer arbitration system is dead, because it’s no longer enforceable. So if you want enforceability, you really have to use real arbitrators, because you have no knowledge of when the peer arbitration system will simply stop working. The approach that we take to this is building a thing called an automated title holder. 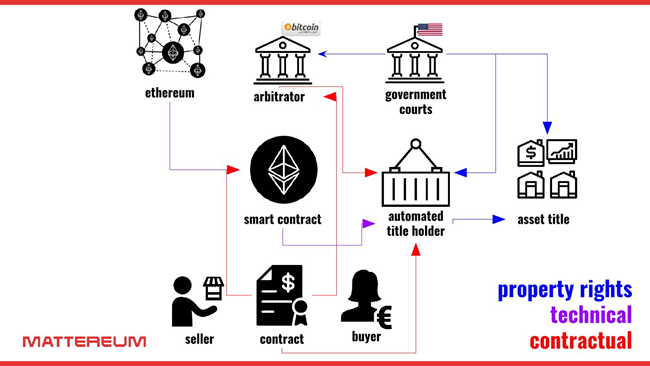 What an automated title holder is it’s the bridge between the smart contracts and the legal world, and it operates by using a whole bunch of very cunning legal and smart contract engineering techniques to bind together an entity which to the court system appears to be a standard corporation, and to the smart contract system appears to be a standard smart contract, and it does a whole bunch of very clever things internally to make sure that those illusions are never broken. 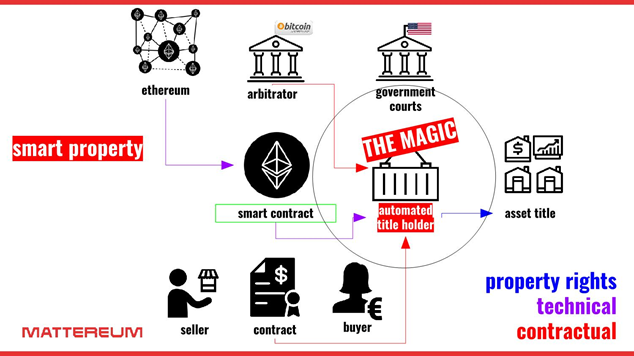 So to the court system it is a company, to the smart contract world it is a smart contract, and it manages the matching of those two realities internally using a bunch of very clever pet tricks, and I’m going to explain a little more about how that works in a moment. Now, the point of this is that what we want here is an ultra-reliable counterparty for a smart contract. So if the idea here is that Ether comes in and that I give you a title deed to a house, the worst of all scenarios is that the Ether comes in and the title deed for the house never comes out, or it gets stuck in some kind of legal trap and it’s stuck there for six months of litigation. We also don’t want a situation where everything is resolved by escrow, because escrow is incredibly slow and expensive; it’s a tax, in the same way that an arbitration insurance scheme would be a tax. You can’t run an economy with 100% escrow for everything, it’s just too much friction; what you need is the ability to enforce award, and this is what we’ve built. How does it work? Here are all of the actors in the system that you actually wind up working with if you want to do this work — it’s a big cast of characters. 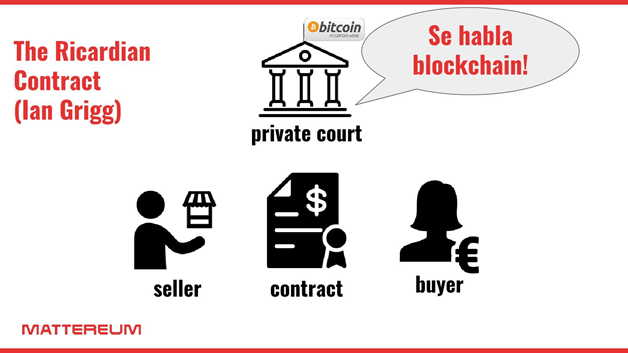 You have the blockchain, you have private courts or arbitrators, you have the national courts… The national courts are in this scheme, because the national court is what rules over the property in the system. If you want to do this with a house or with a painting or something like that, all property recognised by the fiat court system has an owner. So if we want to transfer ownership, we have to do something that works from the perspective of the fiat courts, and that’s why the fiat courts are in the picture. We’re no longer in a situation where we’ve just got crypto assets; what we have is crypto assets on one hand and fiat assets on the other, and our job is to join that stuff together seamlessly. 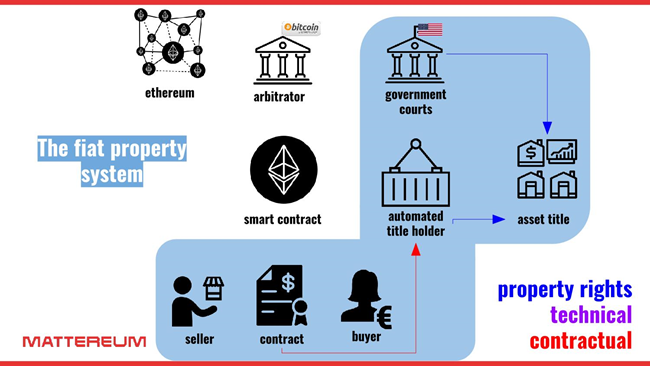 So we’ve got the smart contracts, we’ve got the automated title holder, which is a special kind of corporation, we have the asset title, which is basically an entry on a state ledger for the most part, and sellers contract buyer. Let’s look at the first way of seeing this stuff. This is the wiring diagram of how all these things relate to each other in a fairly simplified way. There are many different kinds of relationships between these entitites. The particular magic happens in the places where you’ve got a single entity which has different kinds of lines coming into it. If you look at the smart contract for example, it has lines that come in from the contract, so the contract is talking to the smart contract, and it also has lines that come in from Ethereum, so that’s a place where the two worlds meet. You can see that the same thing happens with the automated title holder: these are the places where the things cross over. Fiat property system: we all understand this, it’s just buying and selling. 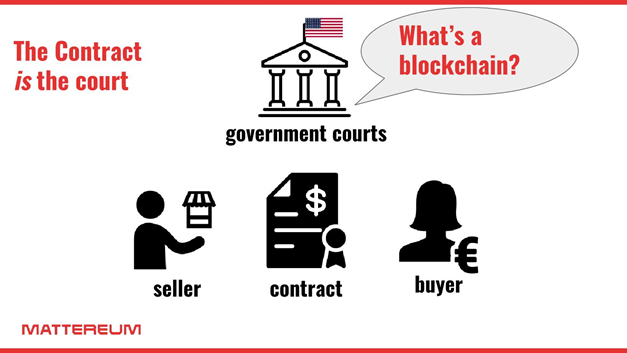 You have contracts, you have courts, there’s no blockchain component there. Contracts go into title holders which control titles, government courts control the titles as well, and you just have the standard scheme where you register change with a land registry and everything updates — no news. 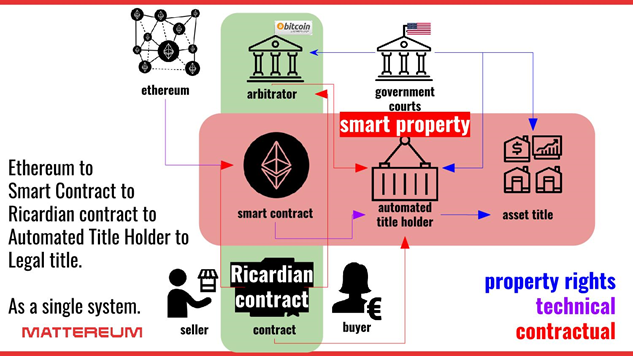 The Ricardian contract, this was invented by Ian Grigg back in the ’90s, is a paper contract that specifies an arbitrator, and it specifies the behaviour of a smart contract. If something goes wrong with the smart contract, the arbitrator has legal authority to go in and fix it, because they’re named in the original paper contract. This is the standard thing that everybody is using to get access to the real world, they are all over the blockchain space. 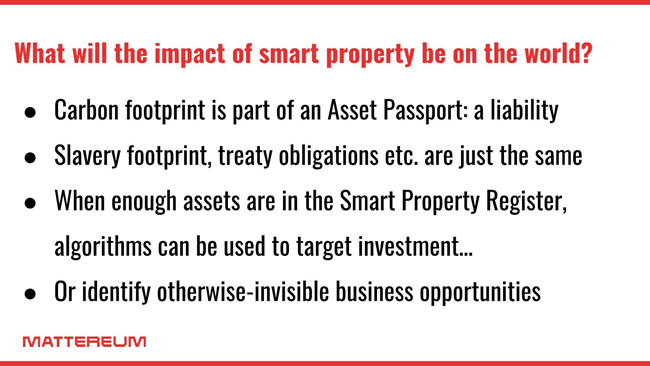 Now we have the smart property — this is the thing that Mattereum is doing, this is the clever part. 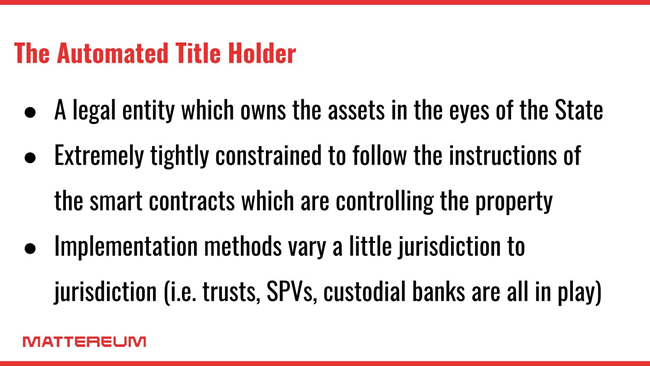 Here we have a smart contract which is tied to an automated title holder, which is tied to asset title. This is like the kind of enormously grown-up, Big Brother version of the special purpose vehicle, which is what’s used for doing things like real estate securitisation. In a special purpose vehicle, you put the property into a special purpose vehicle, a single-purpose corporation, and the equity in that corporation gives you a partial ownership right of the underlying physical property, and all of the real estate tokenisation stuff that you hear about is running on that kind of template. The problem is that in that model the link between the smart contract and the SPV is very weak, because it’s not at all clear why it is that the shares from that SPV are represented by that specific ERC20 token. It’s also not clear where these things would be exchanged, because at this point in history there are no functioning securities exchanges. So there’s a whole bunch of questions about the SPV as a way of approaching this, because the SPVs that we have were designed for interfacing with the ordinary banking system, where money comes in, but if something goes wrong, you’ve got the ability to reverse the payments, and there’s no anonymous banking to speak of. When you take the regular SPV structure and you drop it into an environment that has non-repudiatible payments, and things like Zcash and Zk-SNARKs kicking around, the normal SPV is no longer fit for purpose. It’s just being dropped in deep into the 21st century without any updates, and it’s only a matter of time until you wind up with security tokens which turn out not to be backed by any assets, because somebody has stolen the assets out from under the security token, and the token itself is worthless. Preventing that requires a really radical tightening of how the SPVs operate, otherwise you wind up with extremely hard payments going in one direction, and squishy, vulnerable, attackable SPV tokens in the other direction, so this stuff is a real issue. 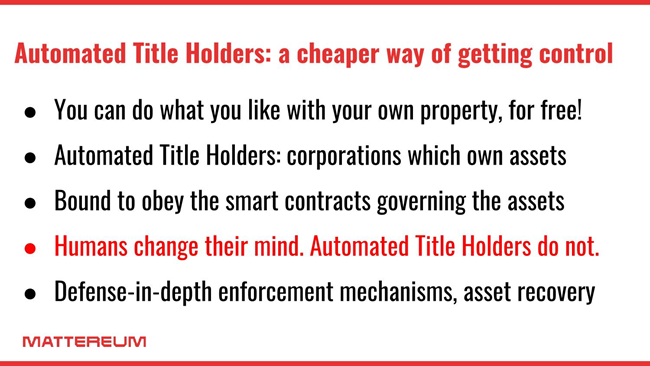 So we have the smart contract, we have the automated title holder, and we have the asset title. Now, what we’re doing here is that we are joining the Ricardian contract that specifies what the parties want to happen to the automated title holder which does the legal control of the assets. 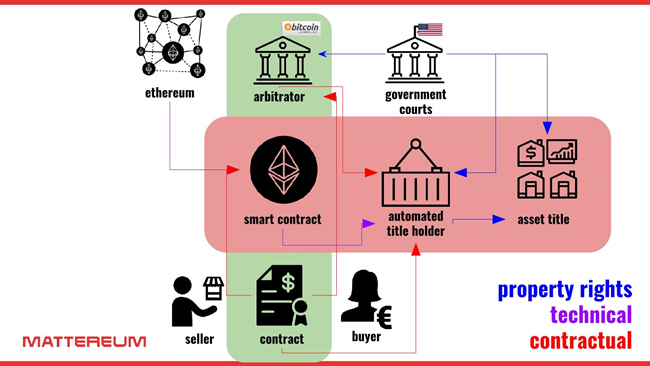 So an instruction is generated between the two parties, we make an agreement, I put my money into the smart contract as a payment, in Ether or Dai or whatever it happens to be, the smart contract is read by the automated title holder systems, and then updates are made to the legal registers that control the assets. What that allows us to do is essentially an atomic swap, where as soon as you see an update on the blockchain indicating that the contract has updated, you can be very nearly certain that you’re now the legal owner of the thing that you bought, and respected by the court in the jurisdiction of the asset. 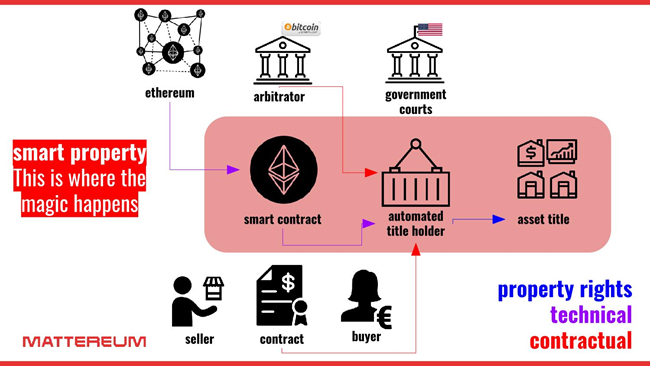 This is the legal machinery that you need to be able to do things in the general format of sending Ether to a smart contract and receiving a villa in Brazil in payment. It’s actually the thing that you need to get all the way to the point where you can go car shopping with your phone: there’s a barcode on the car, you take a picture of the barcode and it tells you how much it is, you send a payment from your wallet, the system updates, and then you pick up the keys and you walk off the lot — it’s the machinery for doing that. Now, things like houses and cars exist on their own registers, they’re a bit fiddly to do so we’re not starting with houses and cars this month; we’re starting with common property, or what they call chattel property, moveable property is another name for it, which is basically stuff like violins or cameras or just ordinary things. But that bridge, once it’s built, every jurisdiction you operate in and every class of property you want to work with is just an extension to that bridge. So you start with the things which are easiest to do, and then you push forward until you do everything, and that’s what we’re doing. That joining of the smart property with the Ricardian contract, as far as we know, that’s never been done before, this is the new thing, and the automated title holders are where the magic are. The internal machinery which makes that possible is why we have taken so long to get Mattereum up to speed, that stuff is extremely subtle and very, very complex. As Mr Wray has learned to say, “Everything simple is a lie.” There’s no way to simplify the legal complexity in these systems. Because if the legal system catches on something, because there is some 1857 law that specifically applies to multi-occupancy flats which have had a flood as a result of a breach of a river caused by a sheep, it turns out that the legal world and your smart contract now deviate from each other and there’s no way back, because the legal system will not respect a smart contract on its own. So there’s no way of doing this that is not about full respect of the complexity of the legal system, and the legal system is the sort of multi-thousand-year-old accumulation of human knowledge about everything that can go wrong when people make an agreement and then try and implement it. So there is no simplifying, it just has to be done the hard way. 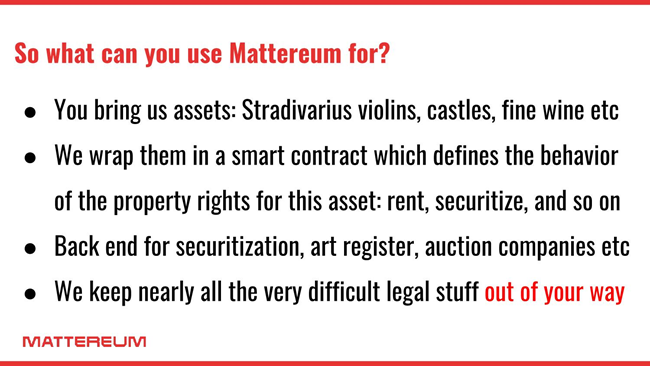 What you can do with Mattereum is this: you bring us some assets, we start with common property in the UK, so you come to us with a bicycle or a camera, or a nine-million-dollar Stradivarius violin, and you say, “Mattereum, I would like to auction this for Ether or Dai, or I want to swap it for a CryptoKitty, but only a really good one,” and we then work with you, and probably your lawyers, to figure out exactly what the paper contract will say under which you’re going to sell this thing. 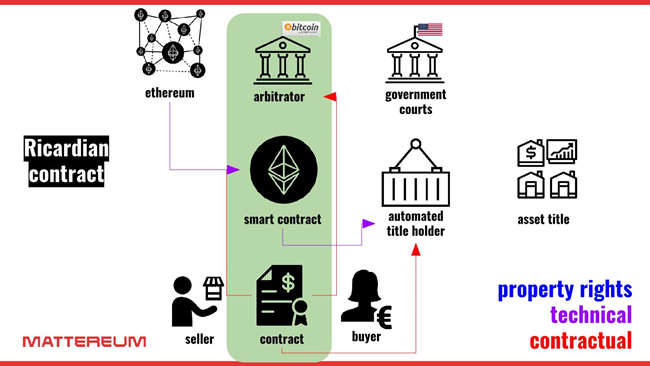 Then a smart contract is prepared which implements the paper contract, and an automated rights holding entity will be created, or we’ll use one which we already have, and the property will be assigned to that entity. Once it’s in that entity, that entity is the legal owner of it, and that entity can dispose of it by for example giving it to a new owner once the transaction is complete. And we can do this now. 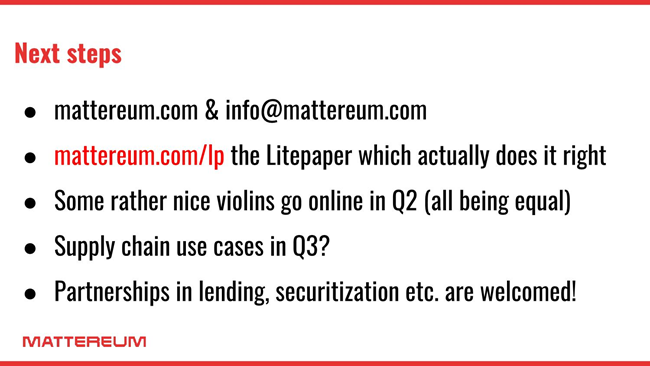 It’s still a bit manual, and there’s a certain amount of handle-turning to make it work, but in Q2 the violins will go online, and in Q3, with a little bit of luck, we’ll start taking things out of industrial supply chains and putting them directly into these systems for use in trade finance. And then after that it’s just going to be a river, because everybody that wants to use smart contracts to control the real world is going to need these kinds of systems to be in play, and at this point we’re the only people in the world that know how to do this. I expect the techniques will spread, but not in a hurry, because everything simple is a lie. Property rails and payment rails: what we are discussing here is the creation of something which is the counterparty to a payment rail. 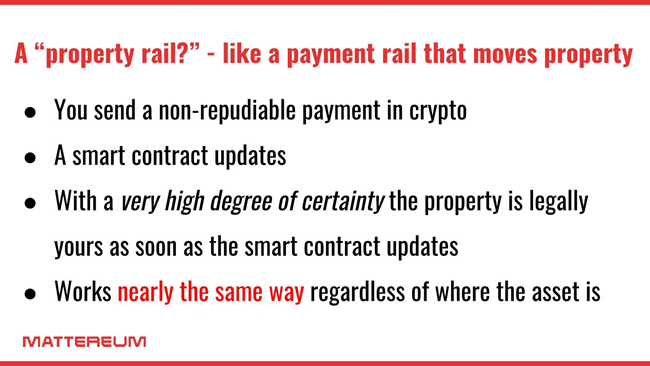 The payment rails use the blockchain to make a payment, the property rail is the thing that gives you the title to physical property on return; the outgoing rail is the payment, the return rail is the property rail. So what we’re building is basically a property rail. How do we verify that the things we think are true or true, how do we get the goods into the system in the first place, how do we verify they aren’t forgeries? The answer is insured oracles. 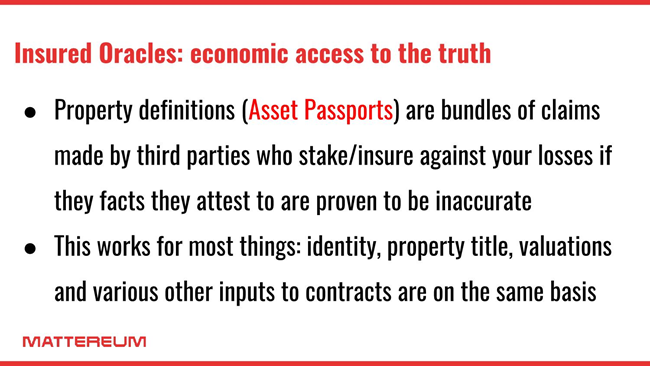 Practically, all of the places where facts go into the system, the fact comes in in the form of an insurance contract, which is a consequential loss contract. In the event that we take these goods into the system on the basis that this is actually a 1955 classic Ford something or other, if it turns out to be a Fiat Punto, somebody has to be legally on the hook for the damages that come out of that. We don’t think there’s any other sensible way of getting facts into the blockchain, but the beauty of this is because it’s an insurance system, if the stream of data coming into the blockchain is extremely reliable, then the cost of data will be very cheap. If you have an automated system which is almost never wrong and it just spits the data directly out into oracles, the insurance on those facts will be extremely inexpensive. If, on the other hand, you’re an art historian and you have to do three months of research to figure out whether something is genuine or not, that’s going to be a much more expensive process, and the insurance policy that you sell as part of that process will be correspondingly much more expensive. So what this provides is a single overarching architecture for getting facts into the blockchain, in a way which could be used commercially. And that’s very useful, because it means that everybody is basically playing the same game, from people that have thermometers which are just constantly outputting what they think the temperature is, right the way through to people that are doing six months of analytics before they decide whether or not something is real, and then they’re publishing the results. It provides a way for data providers to get paid, and it provides a way for data consumers to absolutely understand and limit their risk. The bigger picture on this is that what we’re attempting to do here is do for matter what the Internet did for data in the past 30 years. And I don’t mean just the transmission of data. We can’t physically transmit objects using the blockchain, we’re going to have to wait for the physicists to catch up on that, but it’s all the other stuff that we did to information in the course of putting it online. The fact that every piece of information has a unique name… This clicker does not have a unique name: there’s no serial number, there’s no identity on this; if it’s lost, there’s no way of returning it to its owner — there’s just no way of knowing what it is. If you have a name for things, there’s lots of things you can do, because now the objects are identifiable. It’s so much easier to talk about a particular film or a movie or a book, or a poem that a friend wrote and stuck on a blog, if you’ve got a unique name in the form of a URL than if you’re just going through a description in a search engine. So the first thing is you get precise names for things out of this process. 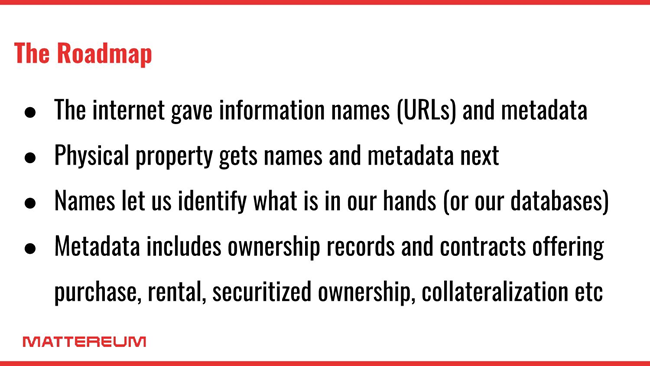 The second thing is that once you’ve got names for things, you can attach metadata to the names: who owns it, where did it come from, how much does it cost? If it’s lost, how do I replace it? If it’s broken, do I claim on my insurance or their insurance, or do I just take cash out of my pocket and give it to the front desk at reception? How does it work? We can start instrumenting the world, so you could take out your smartphone and you can understand the rights that are attached to the objects which are around you. That becomes very useful when you start thinking about renting things. All of the sharing economy stuff that we talked about doing 10–15 years ago, it never really took off, except in a very centralised corporate form through things like Airbnb and Uber. It doesn’t have to be that way. 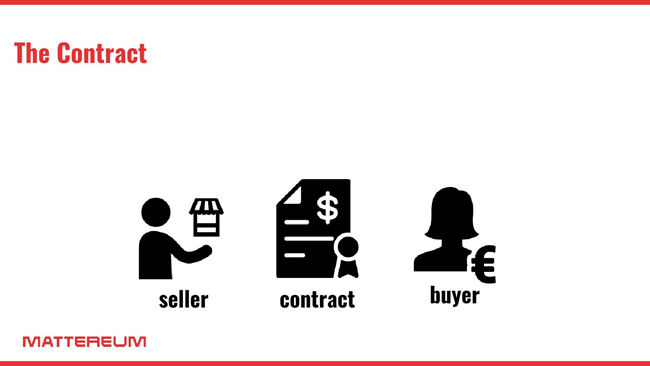 If you’ve got the ability to correctly connect physical assets to smart contracts, there’s no reason that the sharing economy should be a centralised thing at all, and you could have single sharing economy backbones which carry all different kinds of sharing at the same time. You don’t need one app per sharing thing; you could have a much more distributed ownership model. You could go through and spend two weeks tagging every single thing in your house, bind it all to smart contracts, then immediately make all of it rentable, and then half of your stuff might wind up on the road, being carried by friends of yours who have rented it to go and do trips or play concerts or wherever they’re going to do. There’s an enormous amount of overuse of stuff in the physical world, because we just don’t have the architectures in place to do sharing or renting, particularly because we can’t insure things. But if it’s all bound into smart contracts, borrowing it, how to replace it and everything else will get bundled into a single transactional structure. So I think there’s an enormous impact here for reducing the amount of material stuff that we all need to own while maintaining the same quality of life, and that reduces our ecological footprint. I think there’s a huge game to be played there. Once we start thinking about this in terms of ecological impact, we can also start attaching metadata for things like carbon footprint directly to the objects that we’re dealing with. Certifications that things are fair trade or slavery-free trade, a statement about carbon offsetting and all the rest of those kind of things can be tied directly to the asset passports, which means that you can then have policies, like you will pay more to rent something if it’s been carbon offset, or you won’t buy anything that doesn’t have a slave-free trade certification, and the underlying software that runs these systems can simply never show you something which doesn’t meet your ethical standards. If you decide you’re never going to buy anything that doesn’t carry a slave-free trade certification, you can just instruct your software to never show you any offer that doesn’t have that certification attached. So you could begin to automate your moral choices, because your software can simply do the screening for you: you go to the preferences, you set your moral choices, you slide your bars to whatever the settings you want are, and then it just screens the world out so all the commerce which doesn’t fit your ethical standards is never shown to you as a choice. The software will act on your behalf to protect you from your own laziness — I think that’s hugely powerful.